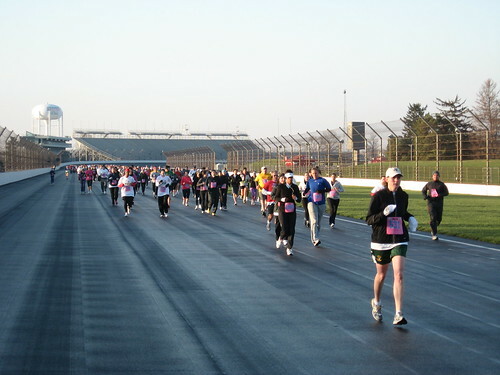 On Saturday, April 2, I took advantage of the opportunity to run a lap around the Indianapolis Motor Speedway. 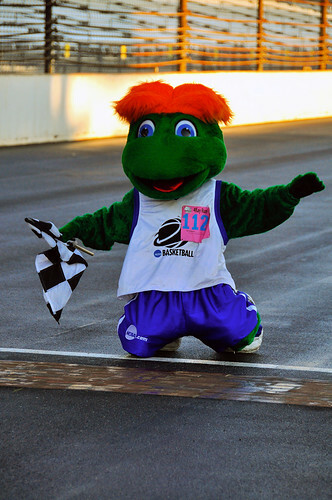 The event was the 2011 NCAA 4Kay Run. The run was one of the many events in Indianapolis in connection with the NCAA Woman’s Final Four. It’s a fundraiser to support the fight against breast cancer held in remembrance of Kay Yow, the late head coach of North Carolina State University. 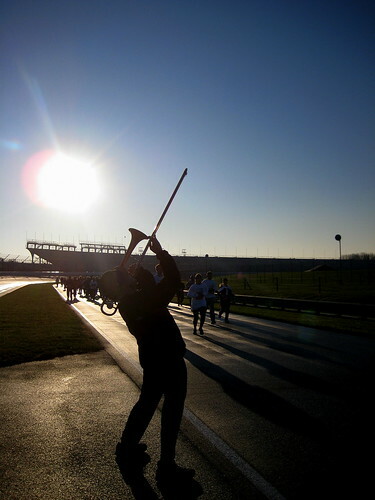 I’ve run a lap around IMS a number of times, but it has always been during the 500 Festival Mini-Marathon. During the Mini, the lap around the track is during miles 7 and 8 of the 13.1 mile run when the strain of the race has set-in. 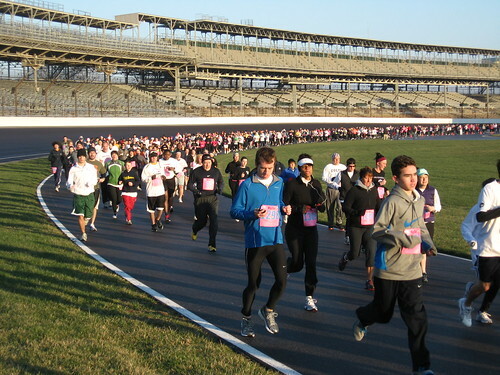 For the 4Kay run, the race length of 4 kilometers (2.49 miles) is one lap around the Speedway. This lap gave me an opportunity to reflect on some of my favorite memories from the past 39 Indy 500’s I have attended. 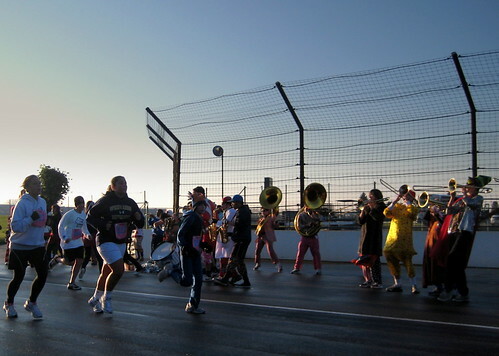 The 4Kay Run started in pit lane at the Yard of Bricks. The start of the run reminded me of the Indy 500 pre-race festivities that take place adjacent to the start finish line – the Purdue Band playing ‘On the Banks of the Wabash,’ the singing of Jim Nabors and Florence Henderson, the somber playing of taps, those “most famous words in racing” and the release of the balloons. I’ve always enjoyed the pre-race pageantry and I can’t wait to see the special events planned for this year’s 100th Anniversary Indy 500. As we headed in to turn 1, I looked for the seats in Stand E where my family and friends have sat in recent years. Like it is for many families, the Indy 500 is an annual tradition for our family. Our tradition dates back to 1972. With the exception of weddings, usually it is the one time of the year where there are more members of our extended family together than any other time. While we were in the short shoot between turns 1 and 2, I looked over behind the Hall of Fame Museum where the State Police have set-up their command post in recent years. The first several years our family attended the Indy 500, our picnic spot and meeting place in the infield was under a big tree at that site. Heading in to turn 2 and seeing the suites on the outside of the turn reminded me of Tom Sneva’s accident in 1975. Although I didn’t see the accident, I was in the infield, and I remember walking over after the accident and seeing the remains of his car in the infield. Back then, they waited to tow the damaged cars back to the pits until after the race. As we neared turn 3, I recalled the accident in 1994 when Dennis Vitolo took out Nigel Mansell during a caution lap. That year, I was sitting high in turn 3, and we couldn’t believe the former F-1 World Champion was taken out during his second and final Indy 500 while in the pit cool down lane under a yellow flag caution lap. As we approached the Yard of Bricks to complete our lap, I could visualize Sam Hornish passing Marco Andretti to win the 2006 Indy 500. Even when I see replays today, I still don’t know how Sam did it. No, I did not make a similar late race pass to win the 4Kay race, but I did accomplish my goal of enjoying a lap around the home of the Greatest Spectacle in Racing. As I crossed the finish line, I thought about the purpose of the run – to support cancer research – and I remembered my mom who is a cancer survivor. She was first diagnosed with cancer 20 years ago, and she continues to win her battle. It took me almost 23 minutes to complete my lap. During that time, an Indy Car would complete about 35 laps. I may have been slow by INDYCAR standards, but wow, what a lap. I’m ready to do another lap to see what additional memories I can stir-up.